Unbeatable prices, downtown on the strip. Clean, modern rooms, DirecTV/HBO, phones, picnic area. Deluxe heated pool with two 20 ft slides. Minutes from restaurants and shopping. Attraction packages available: Boats, Ducks, Jet Boats, Tommy Bartlett Show, Mt. Olympus, Noah's Ark, Kalahari Waterpark and much more. Free Casino 24 hr. shuttle. A small but clean motel. Rooms are comfortable. Staff is nice. All in all not a bad place to rest your head for the price. 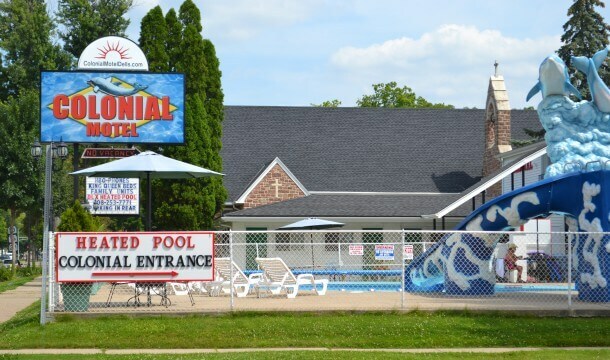 Pool is clean as are the grounds I have stayed there 3 times and would stay there again to save some money to do other things in the Dells. I have been staying at this Motel for the last 5 years and it is a wonderful place. The owners are super great and very friendly. I take my granddaughter up to the dells for her birthday she is 11 now and she always asks if we can stay at this Motel. She loves the pool and the fact that it is clean and quiet. I have never had a problem while at this Motel. I have seen where people are mad and make up stories saying they have bed bugs and that the owners are rude, this is just simply not true. The Motel is very clean and the owners are very nice. If you have ever had a problem while staying there then it is because you went there to party and disturb other guests and that is just not tolerated at the Colonial Motel. I would never stay anywhere else!!!!!!!! !